There are two nice things about being an amateur film critic. One is that I don’t have to see every movie that comes out. Only the ones I want to see. The other is that when I see a movie that leaves little to no impression on me, I’m under no obligation to fake it through a thorough and intelligently written review. That second thing is why this review of People Like Us won’t be my longest, best, or most thorough one. In the film, Chris Pine (Star Trek, Just My Luck) plays Sam, a guy whose estranged father has passed, and who learns he has a sister, Frankie (Elizabeth Banks). Sam is short on cash, when his father leaves Frankie a bunch of it, Sam befriends her and her son, hoping he’ll be able to score at least some of it. Also in the cast are Michelle Pfeiffer as Sam’s mother, who may or may not have known about Frankie, and the lovely Olivia Wilde, as Sam’s long-suffering law-student girlfriend. 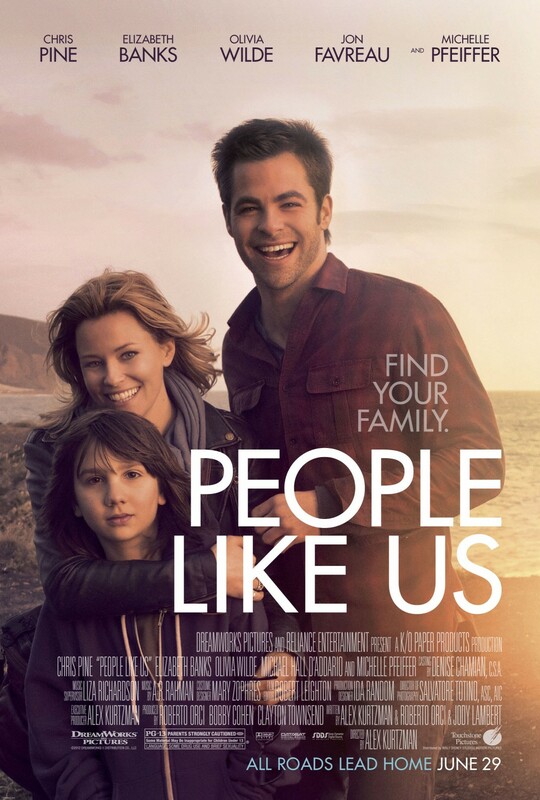 People Like Us was written by Alex Kurtzman, Roberto Orci, and Jody Lambert. Kurtzman (who also makes his directing debut here) and Orci are talented screenwriters and frequent J.J. Abrams collaborators, whose previous work includes Star Trek and numerous episodes of the TV shows Alias, Hawaii Five-0, and Fringe (full disclosure: They also wrote Cowboys & Aliens). Here, though, they’ve let their desire to switch gears and write a more personal story (People Like Us is apparently based on a true story) get the better of them. People Like Us is too long, too predictable, and too little of it really connected with me. Kurtzman adds a few out-of-place but cool stylistic choices, and somehow he elicits a good performance from Banks, but overall, the film just wasn’t the entertaining, heartwarming alternative to big-budget action films that it was intended to be. And on that brief note, I’m giving People Like Us a C.